The word enthusiasm deserves more respect than it usually gets. Literally it means “god within thee.” Sydney Klise is a precocious enthusiast. Recently turned 30, she has owned her own business, Klise Dog, for eight years. She does no advertising, not even a Facebook page, yet she is booked solidly three weeks in advance. She’s also booked Thanksgiving through New Year’s because seemingly everyone wants their dog looking his or her best for the holidays. We asked her to lunch recently, and she chose the Ingersoll Gusto. On our visit, we took a Vincent van Gogh (rosemary olive oil, maple-glazed ham, Genoa salami, goat cheese, capers, fried sweet peppers), her favorite, to the Greenwood Lounge because Klise was on a mission to educate me about the racist and sexist implications amongst the famous Constance Depler dog murals on that bar’s walls. Klise explained that she grew up in Perry and located her first grooming and training business there. When she was ready to expand to greater Des Moines, she chose Johnston because she imagined closing shop in Perry yet remaining close enough to attract her Perry customers. A golfer, cross country runner and dramaturg in high school, she said she grew up around dogs. Training was not her calling. Yet she appreciates training immensely. So where does my education about sexism and racism at the Greenwood begin? 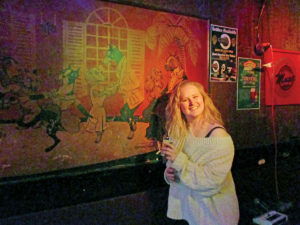 “Look at the paintings on the bar room wall. The dachshund and toy poodle are laid out like Victorian nudes. The Irish setter is portrayed as an oh-so-pretty Irish girl. The basset hound is frumpy, the bartender, either a West Highland terrier or a Tibetan terrier, is obviously male, observant and dependable. Is there conflict brewing in the murals? “Well, the English cocker is obviously flirting with both the Doberman pincer and the boxer, another German breed. That can’t turn out well. Oh, and on the wall, there’s a painting of another lascivious poodle. The Chinese crested and the Afghan hound are made to look both stupid and drunk. The Afghan is wearing a fez like a drunken Shriner at a convention. The dachshund just looks happy, and the badger dog, for some reason, has a higher chair than everyone else,” Klise explained. Moving on to the second Greenwood mural, we see results of the flirting and role playing in the first. “The boxer gets the cocker, no surprise. The Doberman ends up with the dachshund, hmm. The Chinese crested seems to be with the Boston terrier, and the chihuahua is again portrayed as tiny in a role of servitude. The cocker and the boxer both look totally disillusioned with each other, incidentally. The poodle is hooked up with the Dane, no surprise. And the dachshund is staring at a painting of a dachshund. What other insights does Klise have into dog world? What is Klise’s favorite dog story?